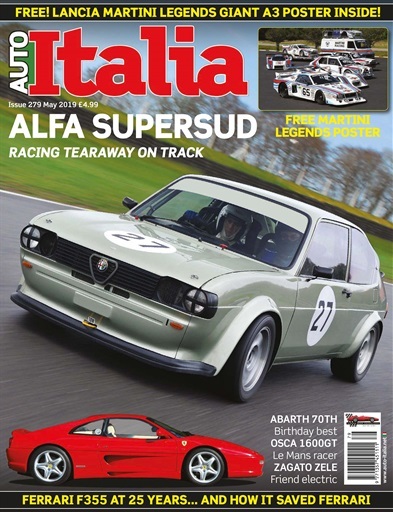 Emblazoning our cover this month is an Alfasud racing car that’s been sensationally successful over the years. That’s a comment that applies every bit as much to Abarth, a badge that’s celebrating its 70th birthday in 2019, and we kick off the party with an in-depth look at the highlights of the Scorpion brand. Another anniversary this year is 25 years of the Ferrari F355 – the perfect opportunity to take a close look at one of the Prancing Horse’s best-loved modern classics. Older classics feature too, with a Maserati Sebring and an OSCA 1600GT, while we appreciate just what a historic powerplant Fiat’s amazing twin-cam engine was. 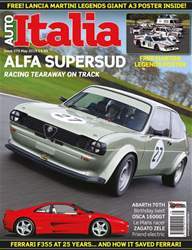 Add in a classic Formula 1 racer, a Zagato electric car from 1974 and plenty of motor show and race action reports, and once again your Italian itch is waiting to be scratched!